PLEASE NOTE: all Revival FM ticket sales and purchases are subject to the Revival Radio Ltd., Terms & Conditions which you can read HERE. 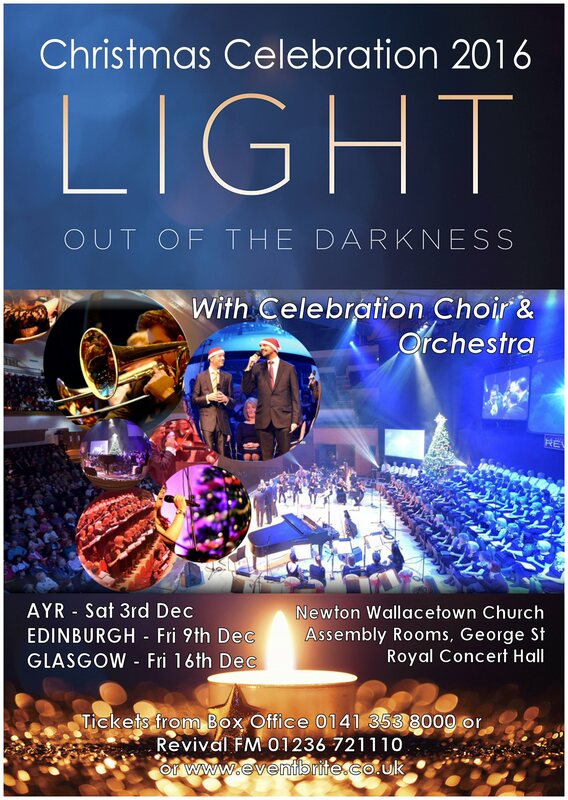 The 2016 Christmas Celebration “LIGHT OUT OF THE DARKNESS” tickets are available for the Christmas presentation at Newton Wallacetown Church, Ayr on Saturday 3 December 2016 and in the capital, Edinburgh Assembly Rooms, George Street, Edinburgh on Friday 9 December also at The Glasgow Royal Concert Hall Main Auditorium on Friday 16 December 2016. You can join The Celebration Choir and Orchestra for the Glasgow Christmas Celebration 2016 on Friday 16 December at The Glasgow Royal Concert Hall, 2 Sauchiehall Street in Glasgow city centre. Call the Concert Hall Box Office on 0141 353 8000 or book online here. Tickets are now on sale for the Ayr Christmas Celebration 2016 at the Newton Wallacetown Church, 60 Main Street, Ayr KA8 8EF on Saturday 3 December at 7.30pm. Also appearing are The Gospel Heirs. Tickets at just £10 are available from the John Ritchie Bookshop, 40 Beansburn, Kilmarnock, Ayrshire KA3 1RL. Telephone the John Ritchie Bookshop on 01563 536394 or from Eventbrite here. Join the Celebration Choir & Concert Orchestra for the Edinburgh Christmas Celebration 2016 in the beautiful Assembly Rooms Music Hall at 54 George Street, Edinburgh EH2 2LR for this, their 6th Annual Christmas Celebration. Tickets available for the Assembly Rooms, Edinburgh here. Celebrate Christmas 2016 with Revival. The Summer Celebration 2016 presentation Into All The World at The City Halls, Glasgow was on Saturday night, 4 June and at the Park UF Church Uddingston, Lanarkshire on Sunday evening, 5 June – both huge successes with large appreciative audiences. 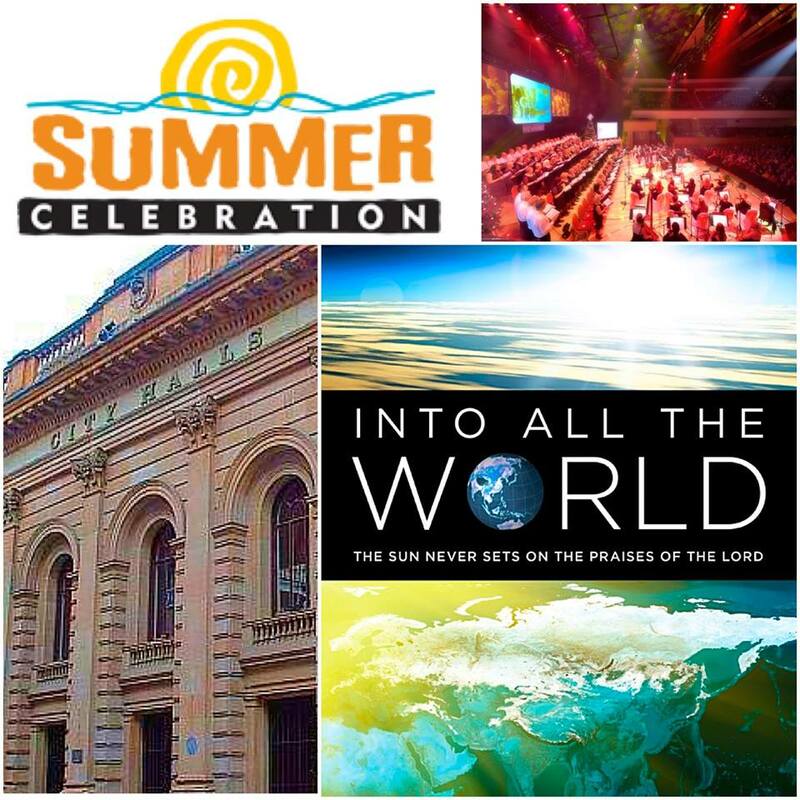 The Summer Celebration featured The Celebration Choir and Concert Orchestra and was entitled ‘Into All The World’ – the sun never sets on the praises of the Lord. It was most certainly a sunny weekend with blue skies and temperatures hitting 24C. It was summer sun outside the halls and summer sun inside the halls with the special message and mission – the sun never sets on the Lord. 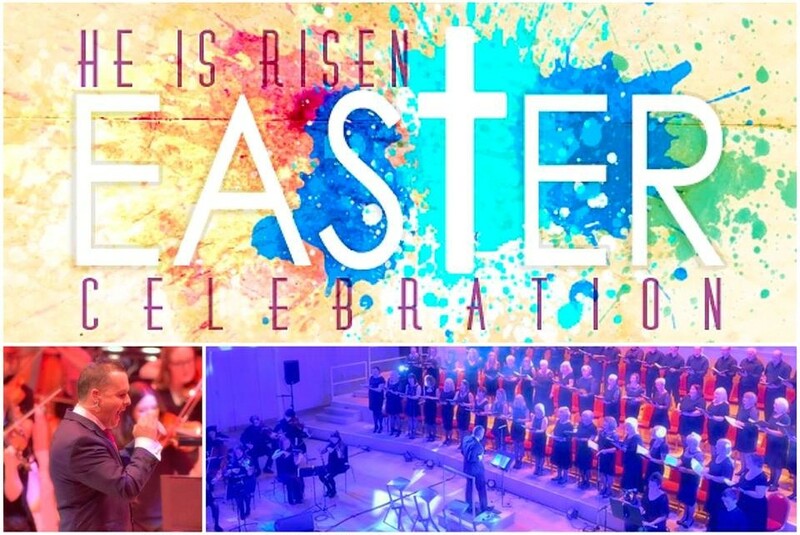 The Easter Celebration 2016 “He Is Risen” was on Saturday evening, 26 March at 7.30pm in The Grand Hall of The Glasgow City Halls, Candleriggs, Merchant City, Glasgow. Another successful presentation in a packed Grand Hall of The City Halls. 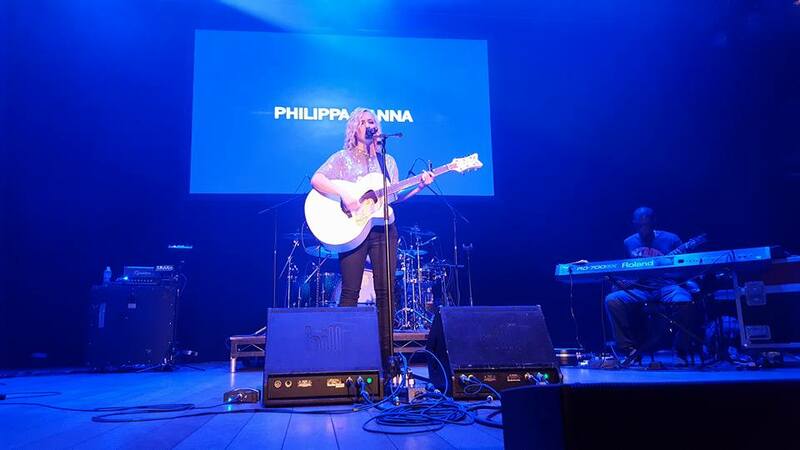 The Revival FM Christmas 2015 Concert presentation focused on the Glorias of Christmas and took place in the Main Auditorium of The Glasgow Royal Concert Hall in Glasgow city centre on Friday 12 December 2015. The 120 strong choir and 30 piece concert orchestra, led by conductor and Revival FM station manager Andrew Polson, brought the nativity story to life through this powerful audio visual presentation. The Celebration Choir and Concert Orchestra presented this, the 5th Annual Christmas Celebration. 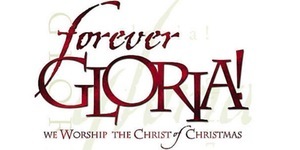 Presenting the powerful audio-visual production “FOREVER GLORIA!” in Glasgow’s Royal Concert Hall, the nativity story was brought to life though music and word. Also appearing were The Gospel Heirs from Glasgow. Christmas Celebrations: Annual spectaculars including at the SECC Glasgow, The City Halls, Glasgow, The Glasgow Royal Concert Hall plus Ayr and Edinburgh with audio/visual presentations and contributors from The Celebration Choir, orchestra from The Royal Conservatoire of Scotland, The Gospel Heirs, Dave Brackenridge & Royal Foundlings, Scarlet Thread, Woodlands Primary School Choir. Easter, Spring & Summer Celebrations: Seasonal specials at The City Halls, Glasgow and at The Glasgow Royal Concert Hall with audio/visual presentations and contributions from The Celebration Choir, orchestra from The Royal Conservatoire of Scotland, The Gospel Heirs, Philippa Hanna, David Phelps, Dave Brackenridge & Royal Foundlings. International Artists: The Gospel Heirs (2016 & 2015), Philippa Hanna pictured left (2016), Crimson River (2014 & 2013), Jonathan Veira (2014 & 2011), Ernie Haase & Signature Sound (2012), Greater Vision (2011), The Hoppers (2011), David Phelps (2011), Allison Durham Speer & Paul Irwin & Greater Vision (2010). Anniversary Fundraising Dinner & Auction: Since 2007, our annual (autumn) event features great fellowship, fun and food which raises much valued funds for the ongoing work, ministry and testimony of Revival FM locally and beyond. The anniversary dinner and auction takes place usually in September on the anniversary of the launch full-time of 100.8 Revival FM on 3 September 2006. Jonathan Veira, Glasgow (2015), In Concert with The Cosmos, Glasgow (2014), Stuart Townend, Airdrie (2014), Keith & Kristyn Getty and Friends, Glasgow (2012), Crystal Clear, Motherwell ( 2011), Gaither Homecoming Tour, Glasgow (2011).